President Trump had a lot of topics to cover outside the White House ahead of his trip to New Orleans Monday. Namely, how the Washington impasse over border security has now kept the government shuttered for 24 days. 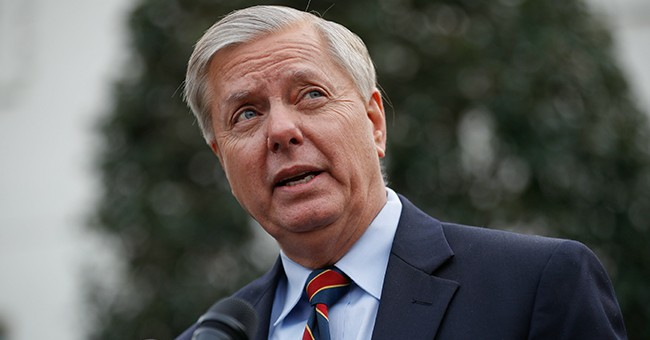 Sen. Lindsey Graham (R-SC) supports the president's plan to construct a wall along the U.S.-Mexico border, even to the point where he urged him to declare a national emergency if the Democrats don't budge. However, Graham recently suggested Trump consider a stopgap spending bill that would reopen the government for three weeks and give them more time to talk with Democrats. But on Monday Trump confirmed he rejected it. The president also continued to sound off on Democrats who flew to Puerto Rico instead of staying in Washington to find a solution. He's been tweeting all weekend how he has been waiting in the White House for Democrats to show up at his door. Judging by the sheer volume of his tweets, he's getting bored. If they really wanted to, Trump said they could end the shutdown in 15 minutes. Instead, he noted on Monday, they're in Puerto Rico "celebrating." Maybe, he said, they're "celebrating the shutdown." RNC Chair Ronna McDaniel made the same observation. Kellyanne Conway also shamed the Democrats' travel plans. "I know it's not Puerto Rico," Conway said outside the White House, but perhaps Democrats can come back to Washington to negotiate. Trump is en route to New Orleans for a speech at the Farm Bureau convention. He is expected to address his trade policy.